Our polyester webbing comes in different colors, widths, and breaking strengths. Some of the applications of the polyester webbing include, but are not limited to: polyester tie down webbing, tent industry, apron tie tape, and commercial seat belt webbing. We coat and finish our polyester webbing on premises and can arrange to have it assembled with metal hooks and harnesses. Please contact us with your inquiries/questions. Polyester webbing can be used for commercial, industrial, and residential use. With a variety of widths, colors, and breaking strengths, California Webbing Mills offers polyester webbing for all types of projects and repairs. Typically used in situations that require higher break strengths than nylon webbing can provide, polyester webbing is able to hold more than 3000 pounds. One of the more common uses for polyester webbing is in the production of seat belt straps. 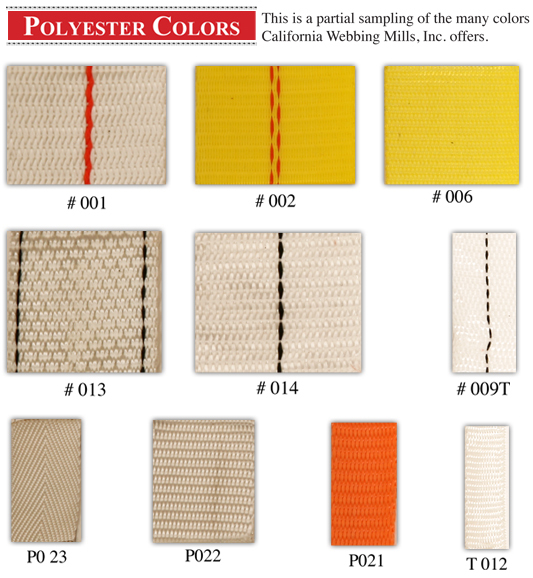 California Webbing Mills coats and finishes all polyester straps in house. Metal hooks and harnesses can also be attached to the polyester straps for immediate use in a variety of situations. Once hooks and harnesses are attached, commercial webbing is ready for professional installation into any car or truck. Racing straps used in Nascar and other professional racing competitions are created from polyester webbing because it is stronger and more resistant to abrasion deterioration. The strength of commercial webbing can also be used to create polyester tie down straps with polyester tie down webbing. Polyester tie downs are commonly used to secure large, heavy, or awkward loads. Whether taking a load of unwanted materials to a recycling facility or transporting materials to a building site, polyester straps can keep the load in place throughout the trip. Differing width are available for your specific load needs. Unlike nylon webbing, polyester does not bend or stretch under heavy loads. Nylon tends to stretch between 20 and 30% under a 2500-pound load. Polyester stretches only 5 to 15%, making heavier loads perfect for polyester webbing. 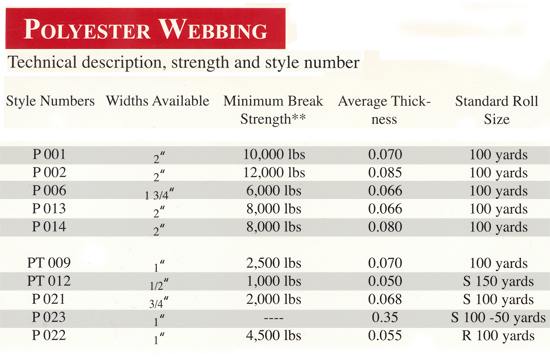 When choosing polyester webbing, width matters. Wider straps tend to have higher break strength and slimmer straps have less. Length is not an issue in terms of overall break strength. Our experts here at California Webbing Mills can work with your project specifications to suggest the perfect width. Polyester webbing is available in a variety of colors and patterns. Special order colors and shades are available upon request. Stock colors include yellow, white, and gray. For a complete list of stock colors, please contact us. California Webbing Mills works with industrial webbing needs as well as personal needs. Consumers are encouraged to contact us with details about their webbing needs and specifications. Based on the environment in which the webbing will be used, specific recommendations can be offered for widths, buckle attachments, or break strength. Special order webbing is available upon request.